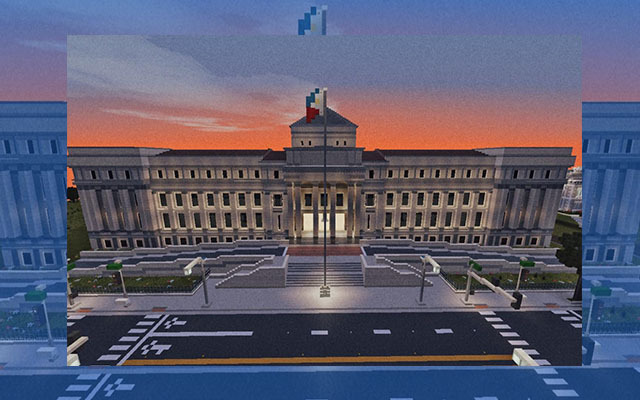 A Reddit user has recreated the historic National Museum of Fine Arts building in Manila, adding to the many Philippine landmarks already in the universe of sandbox video game Minecraft. Reddit user “DrStrange10” shared a facade of the building and noted that it was rendered through the “creative” mode of the game. Filipinos were impressed with the creation, one user even asking if “DrStrange10” had created a Philippine server. Minecraft is a sandbox-style game that allows players to create their own world through three-dimensional blocks and textured cubes. Players can build their own environment through maps and collaborate with other users. They can also go on different adventures and “mine” for their resources. Basically, the game has two modes — “creative” and “survival” mode. The facade that the Reddit user shared was built on “creative” mode, where players can essentially make their own structures. The National Museum of the Philippines was established in 1901 through the now-defunct Department of Public Instruction. It is currently divided into four buildings — the National Museum of Fine Arts, National Museum of Anthropology, National Museum of Natural History and the National Planetarium. The National Museum of Fine Arts was constructed in 1918. Its architects were Ralph Harrington Doane, Antonio Toledo and Juan M. Arellano while its engineer was Pedro Siochi y Angeles. It was not the first time that the particular building was rendered in the game. Previously, a player named “Leif_Arden_Fraginal” also built a rendition of it and shared it in Planet Minecraft. Another player named “Dyeyzzon914” recreated the Rizal Park in a video shared by a Filipino Minecraft community in YouTube. In an interview with an online news outlet, the Minecraft player shared that he built Rizal Park in two hours. Each block was individually placed on the map while he recorded the construction process. “Dyeyzzon914” additionally encouraged his fellow players to be inspired in their surroundings and recreate these through Minecraft. Another player named “Giovanni” also shared his own rendition of the Philippine flag using the game. He shared an 11-minute video on YouTube that showed how he created the flag through his own tools. Filipino Minecraft community “PinoyCraft” also shared a video that showcased some of the most popular landmarks in the country. According to them, it was done to celebrate the Philippines’ 116th Independence Day in June 2014.